David Ishaya Osu was born in 1991 in Nigeria. 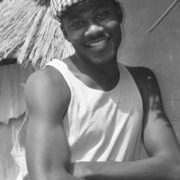 He is a board member of the Babishai Niew Poetry Foundation based in Uganda. His poetry appears in Chiron Review, The Lampeter Review, CutBank, Vinyl , Transition, The Nottingham Review, New Coin Poetry, Maintenant 10: A Journal of Contemporary Dada Writing & Art, among others. David is a fellow of the Ebedi International Writers Residency, and is currently the poetry editor of Panorama: The Journal of Intelligent Travel.